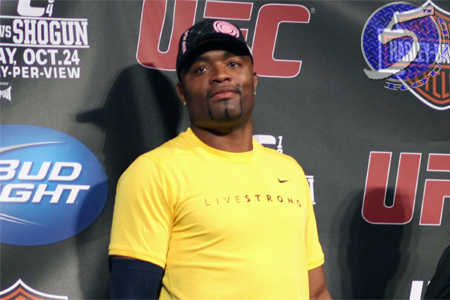 UFC middleweight king Anderson Silva (Pictured) is perfect through his last 15 scraps, which includes nine successful title defenses. Taking into account his torrid run and infatuation with Justin Bieber, it’s easy to forget “The Spider” is 36 years of age. If his injured shoulder allows him to return by mid-June as UFC president Dana White has predicted, Silva will be 37. With the clock ticking away on his time in the Octagon, White has started contemplating how the baddest 185-pounder in bare feet could wrap up his illustrious career. “He’s probably the greatest fighter in history. He hasn’t lost and has been champion since 2006,” White told Brazilian outlet ALPHA (via Google Translate). “I think he has two more title defenses and I do not know what he’ll do next, if he will retire. GSP just went under the knife and faces at least six-months of rehabilitation on his right knee, so the chances of that blockbuster happening is less likely than a battle with “Bones.” Furthermore, Silva has competed in Jones’ light heavyweight division in the past. Regardless, don’t hold your breath for either bout. White believes Silva’s ability to fend off Father Time will be the key factor in determining how his legacy concludes. So he might be long gone before the opportunity arises. “Age is a [expletive], man. It’s the only thing you cannot cheat,” White expressed. “The fighters who become champions never finish his career at its height. Anderson may have the ability to do this. The problem is that you never know when time will end for you.